Beautiful mandalas fill each page of this stunning coloring book from bestselling publishing brand, Jade Summer. Our Magical Mandalas coloring book features 100 mandala designs, including stunning floral mandalas, circular mandalas, and animal mandalas with owls, insects and turtles gracing an array of pages. From underwater creatures, reptiles and forest friends to cute cats, sweet parrots, and pretty roses, our mandala drawings are ideal for both beginner and advanced colorists. 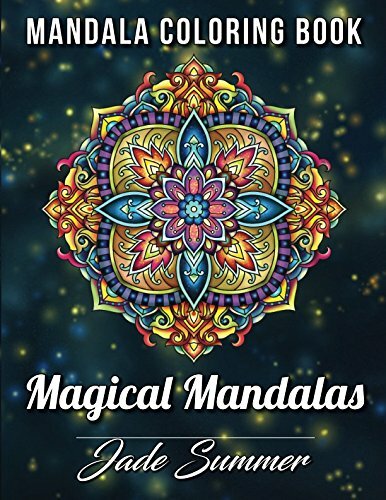 Enjoy unwinding with Magical Mandalas and explore 100 charming images to bring out your inner artist. Join us on a creative adventure and fill each impressive mandala with your favorite shades. Beautiful Illustrations. We’ve included 100 unique images for you to express your creativity and make masterpieces. Which colors will you choose for this book? Single-sided Pages. Every image is placed on its own black-backed page to reduce the bleed-through problem found in other coloring books. Great for All Skill Levels. You can color every page however you want and there is no wrong way to color (even if you are a beginner). Makes a Wonderful Gift. Know someone who loves to color? Make them smile by getting them a copy too. You could even color together! 100+ Coloring Books. Explore the entire Jade Summer collection and find an amazing book for your next coloring adventure. As a Jade Summer fan, you have access to books in a variety of popular themes, including animals, mandalas, fantasy, inspirational, and many more! 6,500+ 5-star Amazon Reviews. Jade Summer is one of the premier coloring book brands and a frequent bestseller on Amazon. When you buy a Jade Summer coloring book, you know it’s a product you’ll love. Fun Online Community. Our fun, friendly, and supportive community on social media is an entertaining way to view completed pages from other Jade Summer fans, meet other colorists, and share your masterpieces with the world.